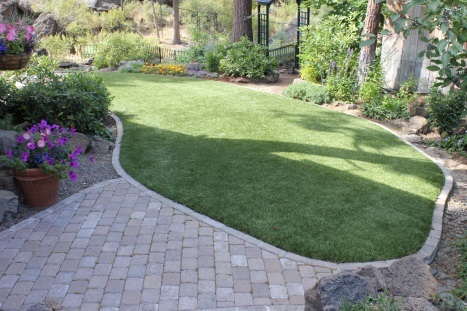 Ron Webb Remodeling is an authorized reseller and installer of artificial grass for TURF-N Central Oregon. Are you tired of…mowing, weeding, high water bills, brown spots, dead areas under trees, and high monthly maintenance costs? Landscape grass is a perfect alternative to natural grass. Over the years, the technology has improved so much that you can’t tell the fake from the real anymore. Click here to learn more about Landscape Grass. Pet grass is made specifically for animals…like dogs, cats, and horses. The grass has a technology built right into the fibers to keep your pets cool. Click here to learn more about Pet Grass. Artificial grass playgrounds are safe and a cost effective alternative to traditional playground surfacing such as dirt, grass, bark chips (which are dirty and harbor insects), and expensive rubber landing areas! Click here to learn more about Playground Grass. If you enjoy golf, you’ll want to have a putting green in your own backyard. Putting greens are great for practicing your shot, a little exercise after work, or just entertaining your friends. Click here to learn more about Golf Greens Grass. Because of the significant costs associated with maintaining football and soccer fields, many communities are considering the installation of artificial sports grass vs real grass. Click here to learn more about Sports Grass. If you’d like more information on any of these artificial grass products, feel free to call our office or complete our online contact form and we’ll get back to you right away. Also, you can check out our Photo Gallery and References for some of our artificial grass projects.